At my office all the morning, and at noon to the Exchange, where meeting Mr. Moore and Mr. Stucky, of the Wardrobe, we to an ordinary to dinner, and after dinner Mr. Moore and I about 3 o’clock to Paul’s school, to wait upon Mr. Crumlum (Mr. Moore having a hopeful lad, a kinsman of his, there at school), who we take very luckily, and went up to his chamber with him, where there was also an old fellow student of Mr. Crumlum’s, one Mr. Newell, come to see him, of whom he made so much, and of me, that the truth is he with kindness did drink more than I believe he used to do, and did begin to be a little impertinent, the more when after all he would in the evening go forth with us and give us a bottle of wine abroad, and at the tavern met with an acquaintance of his that did occasion impertinent discourse, that though I honour the man, and he do declare abundance of learning and worth, yet I confess my opinion is much lessened of him, and therefore let it be a caution to myself not to love drink, since it has such an effect upon others of greater worth in my own esteem. I could not avoid drinking of 5 glasses this afternoon with him, and after I had parted with him Mr. Moore and I to my house, and after we had eaten something to my lodgings, where the master of the house, a very ordinary fellow, was ready to entertain me and took me into his dining-room where his wife was, a pretty and notable lady, too fine surely for him, and too much wit too. Here I was forced to stay with them a good while and did drink again, there being friends of theirs with them. At last being weary of his idle company, I bid good-night and so to my chamber and Mr. [Moore] and I to bed, neither of us well pleased with our afternoon’s work, merely from our being witnesses of Mr. Crumlum’s weakness. This day my boy is come from Brampton, and my wife I think the next week. "I went to our Councel to passe severall other statutes: We had now resolved upon the Armes of the Society: that it should be a field Argent, with a Canton of the armes imperial of England: the Supporters two Talbots, argent: The Crest an Eagle or, holding a Shield with the like armes of England, viz: 3. Lions: The Word, Nullius in Verba, which was presented to his Majestie for approbation, & orders Given to Garter K. at Armes to passe the Diploma of their office for it. I returnd home:"
It's not often that Our Sammy makes me smile, but this did. "At my office all the morning, . . . it has such an effect upon others of greater worth in my own esteem." A magnificent English sentence, of no less than 214 words, which maintains correct grammar throughout while its style graphically embodies the situation it describes. One problem with climbing on the wagon is that there's no climbing off again: you have to fall. "that the truth is he with kindness did drink more....I could not avoid drinking of 5 glasses this afternoon....too stay with them a good while and did drink again"
"where his wife was, a pretty and notable lady, too fine surely for him, and too much wit too"
Surely after more than five glasses of wine, even on a full stomach, Sam's perception of wit and prettiness might have been impaired! not that something like that would ever happen to me, or course. I have to admit to looking forward to seeing how Sam deals with Wayneman and what we learn about what on earth he has been up to. Sam has got a great deal to get sorted out before Elizabeth gets back. He can't afford to spend time as he does today. It rather sounds as though Mr Crumlum (or Cromleholme) has not been having a good time with ex-pupils or current pupils recently and is very glad to see a pair of them who have done well. Maybe he's lonely too. Sam obviously held him in very high esteem and now has found he has very ordinary human failings. Let's hope Sam can continue to see his estimable qualities whilst excusings his foibles. Seeing Mr C like this seems to have had a more sobering effect on Sam's opinion of those who drink too much than such episodes as himself waking up in his own vomit. Sam had known and admired him since he was 13 at St. Paul's according to Tomalin. It seems likely the poor man had gone through a great deal of anxiety during the Restoration, having been appointed headmaster before the change. I'd guess Australian Susan was quite right in thinking he'd had trouble with pupils and ex-pupils recently, including a few who probably tried various gentle forms of blackmail or to shove him out of his seat. To meet a success story like Sam must have been quite a relief, but he may also have been desperately relieved to find that his well-positioned former student still regards him with affection and might be counted on in a crisis. According to Tomalin, Cromleholme has one of the best private libraries around. I would not be surprised if a few thugs in Cavalier clothing-Downing's boys, a Creed type, have been paying a few calls suggesting he "donate" a few tomes to the King, etc... Given the times it's little wonder the poor guy wanted to be seen as much as possible with his good friend the Clerk of the Acts. Thug? Where'd you get that idea? Hmmm, need your votes here everyone--how many think that tomorrow's entry will begin with a hangover??? I've heard of "keeping up with the Jones'" but in this case keeping up with the Crumlum is probably going to cause a headache in the morning. Slightly off topics but an interesting thing to share--I am NOT the seller! Il vaut le detour indeed, Jeannine! "A good pair of early English silver cufflinks which date to the period of the Restoration in England of Charles II. They would have been worn by royal supporters of Charles at his marriage to Catherine of Braganza on 20th May 1662." If you're tempted by the cufflinks (and I was), you might want to know that there is only one link on sale, not an actual pair. I had used to think that decorating items with tacky lovehearts was a modern aberration, but the cufflinks (or link as we now know), proves me wrong. "...did begin to be a little impertinent..."
1. not pertinent; having no meaning, importance, or relationship to a given matter; irrelevant; pointless. 2. not suitable to the circumstances; inappropriate; incongruent. 3. not showing proper respect or manners; saucy; insolent; impudent. Sounds like drunken meanderings. Sad for Sam and Mr. Newell. Probably not attributable to current students and their pranks, but Robert Gertz's view that "history is to blame" makes sense. By the way, if you look closely at the coat of arms of the RS in the picture I found, you will see that the Talbots (large breed of dog like a cross between a Great Dane, an English Mastiff and an English Foxhounds, now extinct)have become brown and white, not just white as the "argent"colour implies. Wonder why the RS chose dogs as supporters for the C of A? Why not more regal animals ro birds? Or ones implying sagacity such as owls? Talbot Hounds were rare in England at this time. They are related to Bloodhounds, so maybe that is the reason for the choice - they were good at tracking things down. See http://www.bhlegends.com/breedhistory.html for information about Talbot Hounds. It's not especially personal...By position, if Sandwich were to join in the fun of terrorizing old Cromwellians for profit, he'd send a Creed level fellow to lead the gang. In fact my note on poor Cromleholme reflects something I've been thinking about in that Sam's picture in the Diary of the current scene is a bit rosy due to his exalted position...Though even his images of the pleasant times in Restored England are loaded with unavoidable dark moments. It strikes me that we are getting a slightly distorted view from a man very pleased with his lot who'd rather not dwell much on the "foul dust floating in [the] wake" of the Restoration. He and Coventry seem to represent a kind of emerging technocrat movement in the government, with Coventry apparently taking the political side of the "benevolent despot" party-ideally an absolute monarch leading a government of capable technicians. How far these two very capable and devoted public servants can close their eyes to the sordid and press for that ideal vision will be very interesting to see. Arms of the R.S. : the "Talbots argent" occupy exactly the same position in the coat of arms of the Talbot family. Charles Talbot, Earl of Shrewsbury, was Sam's contemporary, and was later promoted to "Duke" by James 2nd. Was he big on science ? or just big...? This from several 'heads' that I found of interest to pull from your post, Robert Gertz. Keep us posted as you follow this thread of Coventry and Pepys (technocratic idealists) contending in an environmnet of a restored monarchy under a man of seeming sensibility and reason, whose father has been beheaded and who is influenced by his exile abroad and contact with continental monarchies. Of course for the sake of future parlimentary democracy, it might be best that Coventry has the ear of the wrong Stuart. I join Pauline in commending Robert Gertz's reflections on Sam's place in the larger picture of the Restoration. But again, for the sake of our future democratic freedoms, we may have to hope Sam...Or at least Coventry, despite the noble ideals, fails. RE: Oz Sue's surprise at the use of "tacky lovehearts". Have a look at Franz Hal's Laughing Cavalier from 1624, esp. the embroidery work on the sleeve. Heart work if you can see it. Makes me think it has been around a lot longer than that. In addition, I always wondered how that shape came to represent a human heart till I saw a pair of swans entwining from their breasts to their heads. They outlined our heart of love. No idea if it is coincident. Loved the 'fight with a feather'. Unfortunately Australian Susan's link to the Arms of The Royal Society has been lost. The current link is to a modern drawing only of the shield without the supporters and crest. but this is still a modern representation. "Our origins lie in a 1660 ‘invisible college’ of natural philosophers and physicians.....The very first ‘learned society’ meeting on 28 November 1660 followed a lecture at Gresham College by Christopher Wren. 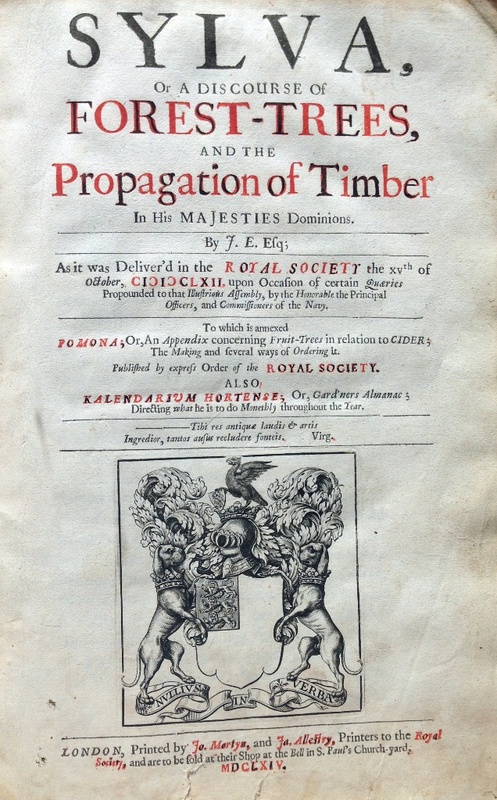 Joined by other leading polymaths including Robert Boyle and John Wilkins, the group soon received royal approval, and from 1663 it would be known as 'The Royal Society of London for Improving Natural Knowledge'." An early representation of the Arms can be seen on the fronticepiece of John Evelyn's "Sylva", the first book published by the Society (in 1664). In neither of these representations are the talbots shown as other than white (argent). The only suggestion I can make as to why the talbot supporters were chosen is that talbots were hunting dogs and the Society was hunting for the truth. Does anyone know if Pepys ever saw any Greek Drama? Aeschylus? Sophocles?Euripedes? "Does anyone know if Pepys ever saw any Greek Drama? Aeschylus? Sophocles? Euripedes?" Paul Lazest, I'm suspecting he didn't, even in English as we would, and not by authors of those names. The stock of Restoration theatre were revivals and adaptations of others' plot-lines (French, Spanish, Roman).